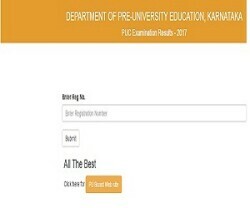 Karnataka's Department of Pre-University Education has declared the second year pre-university or Class XII exam 2017 results on Thursday, May 11. "Much awaited PUC results to be announced on 11th may Thursday 2017 at 3.00 PM and SSLC results on 12th May Friday 2017 at 3.00 PM," tweeted Karnataka Primary and Secondary Education Minister Tanveer Sait. The Karntaka Board Class XII exam started on March 9, 2017 and ended March 27, 2017. While 6, 84, 490 students appeared for the exam this year, the paper correction and evaluation of PUC exams were completed in April and database works to upload the results were ready in the first week of May. In 2016, the overall pass percentage of Karnataka 2nd PUC result was 57.2 per cent, a dip by 3 per cent from 2015. Last year, Karnataka Board PUC result was declared May 25. Due to heavy traffic, there may be some technical glitches in the web server minutes after the declaration of result. Alternatively, students can check their results on our website. Step 1: Click on the option below.